NOTE about the next two circuits: WDC no longer tests or specifies the gate delays between Φ0 in, Φ1 out, and Φ2 out for their newer 65c02's, and they would prefer that the designer use an external oscillator. All the same internal inverters seem to still be in place however, so I have little doubt that the circuits below will still work fine; but I had to pass the info on. One of our aircraft products designed in 1993 uses this circuit, running at approximately 1MHz, and has proven 100% reliable. Good oscillator design is rather math-intensive (S-plane anyone?). You might get one going but find out months later when the weather heats up that it doesn't want to work anymore; or you might not have the crystal resonating in the right mode, evidenced by the frequency proving to not be what you thought. If you use the can, the details of making an oscillator that's stable and dependable under all conditions have already been figured out for you. If you're attracted to the fun of making your own, look at it this way: plugging in an oscillator can leaves you more time to work on other parts to make your computer do more. If the clock oscillator's output is 4MHz, the flip-flop's output will be 2MHz. The flip-flop's output will have a 50% duty cycle, because every time the oscillator has a rising edge, the flip-flop's output changes logic state, and the oscillator's falling-edge timing doesn't matter, because it doesn't do anything. Note that the Q1 output will be like a Φ1 or a Φ2 but will be just slightly ahead of the processor's Φ1 and Φ2 outputs. If you need such a signal in the glue logic and gate delays in the glue logic are a problem, this may be a solution. It will probably be more useful in a 65816 system, particularly for latching the bank byte with a '573. You may someday want to single-cycle the computer so you can see what's on the buses at each cycle. You can't do this with the NMOS 6502 because its internal registers lose data if you slow the clock down much below 100kHz, but you can stop the 65C02's clock with Φ2 high indefinitely, and WDC's '02 can be stopped indefinitely in either phase (with Φ high or low). The diagram below shows a circuit that debounces a button push and produces a 1µs (give or take) down-up pulse every time you push the button. This really is only useful in certain debugging situations where the problem happens immediately (or almost immediately) after start-up. (If it's not soon after start-up, it will take too many button pushes to get there.) 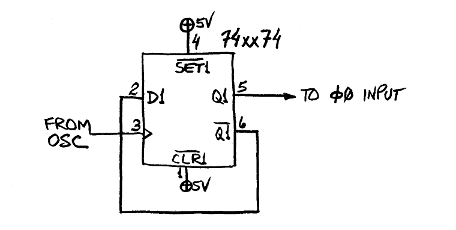 It would temporarily replace any other clock source that you have feeding the Φ0 input (pin 37 of the DIP). Another circuit lets you single-step, IOW, go one instrucion at a time, rather than one down-up clock cycle at a time. This is different from single-cycling in that the steps stop on the op codes only, not showing you what happens when operands or data are on the data bus. Otherwise, you will connect the Φ2 pins of all the 65-family parts together (the processor having the Φ2 output that feeds the Φ2 inputs of all the I/O chips), and connect the R/W pins to each other the same way. The R/W line will also go to the RAM chips' WE pins. There's no need to take R/W to the ROM as well. Although writing to ROM will cause bus contention without it and possibly high currents, it's definitely within the programmer's power to avoid writing to ROM addresses, so it's not a problem. If you want to see how fast your creation will go before it starts having problems, instead of buying a whole series of crystals or oscillators at incrementally higher frequencies to try, you can make yourself a variable-frequency oscillator (VFO) as shown in this forum post or the link it contains. Connect it only temporarily for the test and gradually turn the frequency up until you find problems, and then measure that frequency. A frequency counter is best, but you can get within perhaps 5% by measuring the period on an oscilloscope and inverting the number. 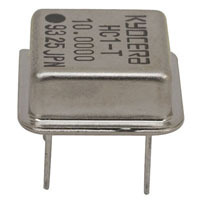 Then get whatever standard-frequency crystal oscillator happens to lie in the 70-75% area, to make sure you'll have some safety margin for when operating conditions are not ideal (like higher temperature, an additional bus load when you expand the computer, or a slightly lower power supply voltage). Under good conditions, parts will usually go quite a bit faster than the specifications say; for example you may get 4MHz 65-family parts to run at 7MHz; but they're not guaranteed to meet the specified timing margins anymore, so the 4MHz parts would require faster logic and memory than say 10MHz parts would at the same speed. 2/17/19: Jeff Laughton posted a very simple clock-stretching circuit to replace a RDY circuit, here. It does not affect VIA timing. :) Note that the NMOS 6502 does not pay attention to RDY in write cycles; so if you have to use NMOS with something that's slow to write, this will take care of that. His RDY circuit is here.